Measure from here and continue west (left) along the fjord, the sign says Laukeland. The road heads inland towards the very impressive face of Kvamshesten. After about 1.9 km, locate a small road that goes right. Turn onto this road, drive by a house on your left, and turn left after about 200 meter. This road is the first going left after the previous intersection. Head up the hill towards a house, make a right turn and continue along this road that now turn into a forest road. There are two gates along the road that must be opened and closed behind you. After about 3.2 km from your start of measurement (or about one kilometer along the forest road), the road crosses the creek just before the second gate. Continue less than 100 meter and park without blocking the road. This is the best trailhead for this route. Route description: From the parking area, continue along the forest road, do not go left. The road is fairly level heading east, before switching left and gradually gaining more elevation. The road ends near the creek at a place that seems almost perfect for a camp site. The route continues along a trail that heads our slightly to your left and more or less follows the right hand side of the river. The farm cabins, Kvamsstølen (470m) are nicely situated in the bowl that forms the end of the valley. From here, head up the pretty obvious slope on the right side of the river. 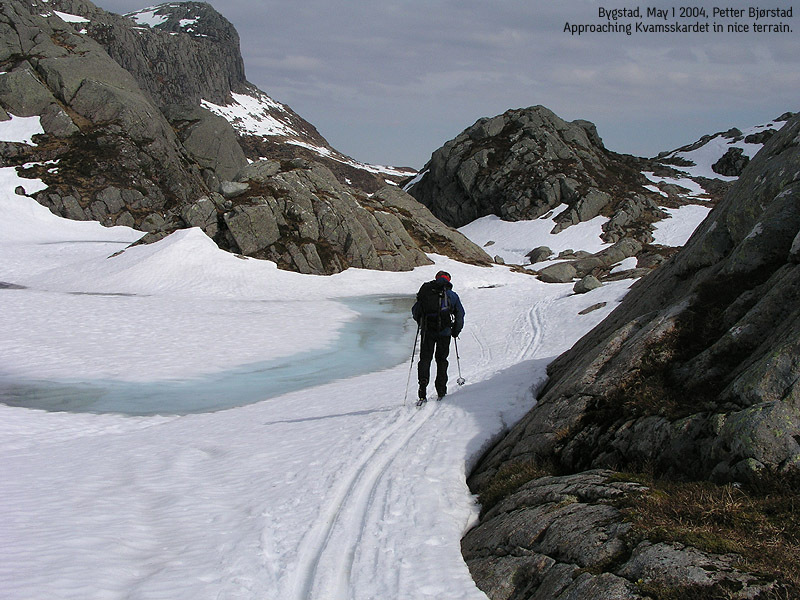 There is a pretty good trail, but it may be hidden by patches of snow (in the spring). Comments: I did this trip with my friend Arnt. We drove from Bergen at 0725, and started hiking from the car at 1040. We made the farm cabins, Kvamsstølen (470m), after one hour and the top of Kvamsskardet (680m) at 1210. The summit was reached in 4 hours at 1440. After 20 minutes enjoying the 360 degree panorama, we started the return and reached the car at 1710, a 6.5 hour trip in good spring weather. 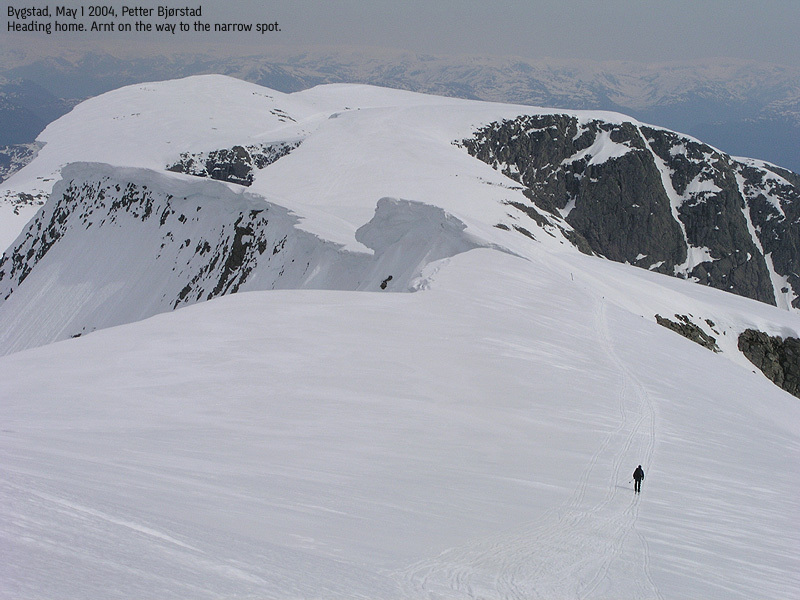 Two hikers started out for Kvamshesten from Kvamsskardet at the same time, a single man (Kjartan) headed towards Blægja. Later, at the narrow spot on the ridge, we met Sunnfjord turlag (about 15 people) descending and later we caught up with them back at Kvamsskardet. It is nice to see this many people enjoying such a fine day in the mountains. 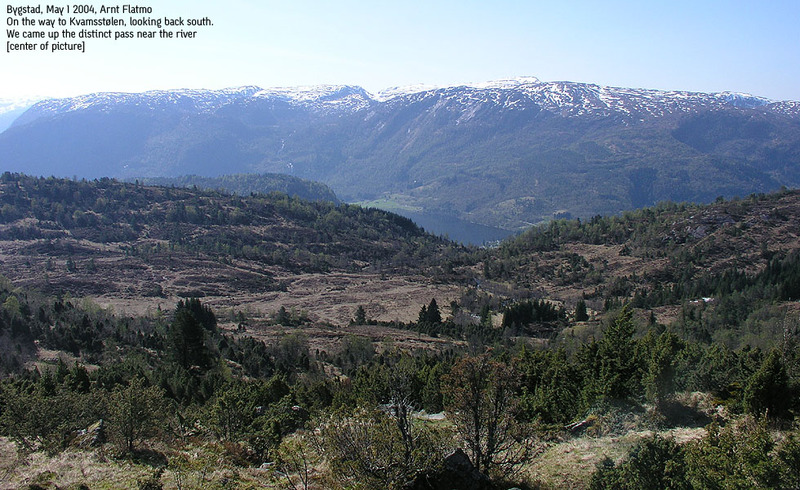 A look back towards Bygstad, the forest road gives access to the plateau below. A proper first of May parade, Indre Sunnfjord Turlag on their way down. On the summit of Blægja. Panorama north, as seen from the summit. The Blægja ridge, looking east on the descent. 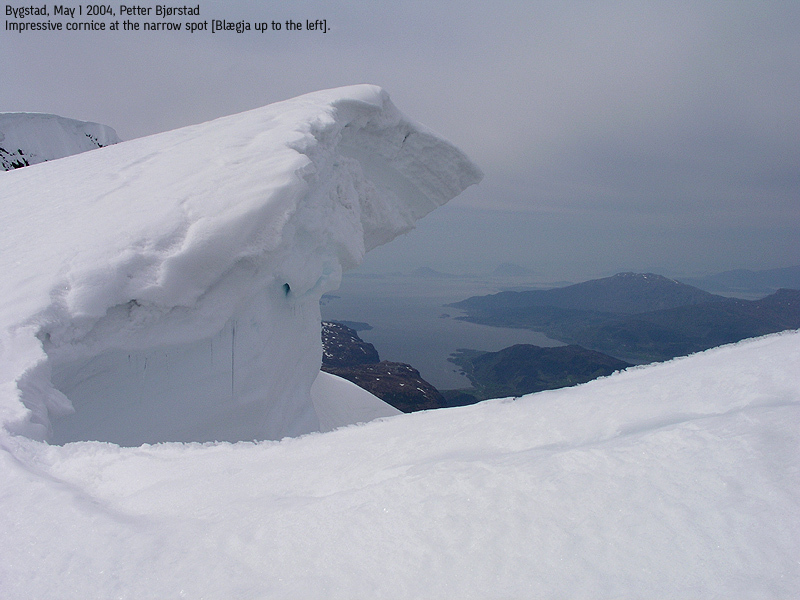 Cornice view, Looking west at the Førde fjord. The picture is taken from the narrow spot on the ridge. 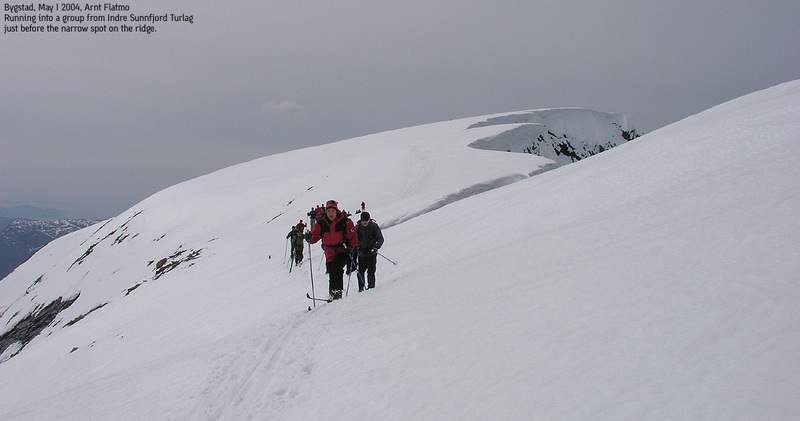 Arnt skiing towards Kvamsskardet, the last part of a very nice ski climb.